PBS has a new series called Home Fires which is inspired by Julie's Summers book entitled Jambusters. It tells the story of the Women's Institute during WWII. 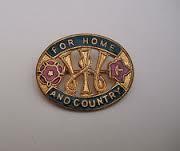 Founded in Canada in 1897, the WI made its way to the UK during WWI, first to Wales then to Britain. 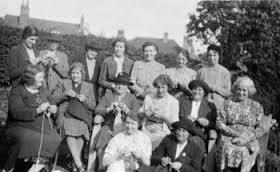 According to Wikipedia the Institute “had two clear aims: to revitalise rural communities and to encourage women to become more involved in producing food during the First World War.” A review of social historian June Robinson's book A Force to be Reckoned With states that the club's “wholesome” activities included temperance, family planning for the married, mobile libraries, chicken-keeping, and above all jam-making. I'm enjoying the PBS series which appears to be capturing the feel of the WWII era while creating realistic characters who deal with living in a country at war. Many of the character's problems are similar to those faced by people today: providing for their families and keeping a roof over their heads. However, added to that was the danger of falling bombs, sons and husbands going off to war, and items used in every day life being tightly rationed or totally unavailable. 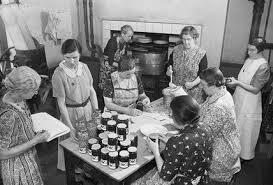 A civilian organization, the WI had over 300,000 members during WWII, and food production was a major thrust of the group's activities. At the beginning of the war, they had set up nearly two hundred preserve centers, and by 1940 there were well over 2,500. The produce was then taken to market where it was sold. Proceeds went back to the WI to purchase supplies and fuel for transporting the goods (because as a non-military organization, the WI didn't qualify for extra gas rations). There are numerous websites that discuss the social impact of the war that resulted in changing roles for women-working outside the home, performing jobs previously held by men, managing household finances and more. However, what strikes me about the Women's Institute as extraordinary is how much they accomplished all while staying within the confines of society's expectations of women.